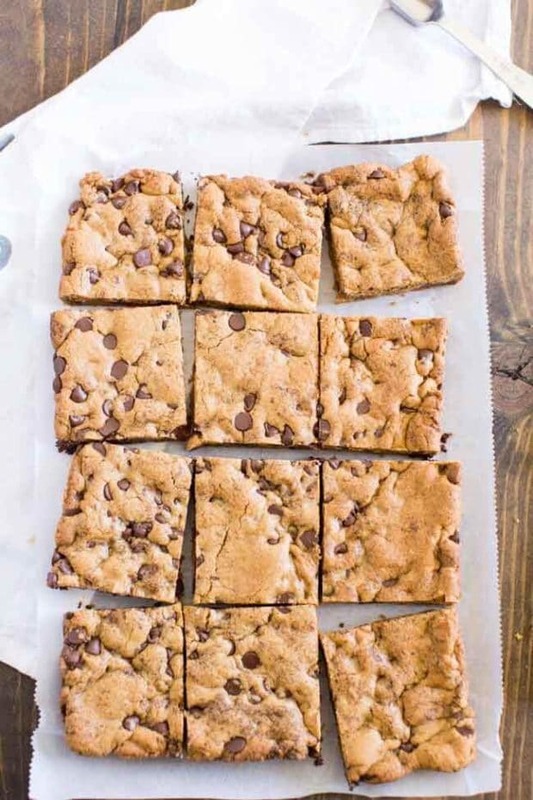 These easy, homemade chocolate chip cookie bars are oh-so-good! 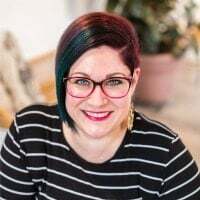 Ready to make some mom-magic? 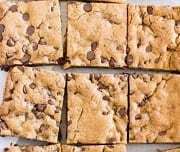 I have a delicious, Old-Fashioned Chocolate Chip Cookie Bar recipe that’s quick n’ easy to share with you. It’s one of my favorite recipes — it creates soft, thick, chewy cookies that everyone will love. Shopping, baking, decorating, and must-do Christmas traditions…you know how crazy the holidays can get. And the boss still expects you to come to work…. the nerve! In the middle of busy, last year I decided to have a few friends and their kids over for a casual get-together. Let’s make more memories! We waited until the day before company was coming to decorate the tree. We sang carols, ate treats, and had a great time. I made a couple of casseroles so I could just pop them in the oven when I got home from work. I planned to make these chocolate chip sheet cookies as well for dessert. Everything was company ready. I was feeling like Supermom. The next day I came home, opened the door, and found one of our two cats had replaced the tree topper with himself. I stared at him swaying on the upper-most branch. Those cats had totally un-decorated the tree. Ornaments—some broken—were on the carpet and under the table. I had this ridiculous, fleeting thought of how pretty the sparkles looked all over the floor. I headed for the kitchen and put the casseroles in the oven while barking orders to get the vacuum, stay away from the tree, turn on the Christmas music, leave the cookies alone. I kicked into high and cleaned up the broken pieces of Christmas cheer. And since there was no time to decorate again, I had a naked tree with white twinkle lights. Then I realized something was burning. Dinner wasn’t ruined, but it had run over in the oven and it was a little extra-crispy around the edges. I assure you I was not feeling very merry when the doorbell rang. I grabbed a can of air freshener and sprinted through the house, feeling akin to Ebenezer Scrooge and wondering why I had thought an extra get-together was a good idea. But we ended up having a sweet time that night even though there were no shiny baubles. One of my friends commented on how peaceful the sparkly lights and pine scent made her feel. She had no idea it wasn’t the look or mood I was going for! This recipe is Melodee’s (our blog photographer) version of the famous Neiman Marcus cookies. Baking in bar form makes baking them quick and easy, perfect for busy holidays or everydays. I always begin by preheating the oven—to 350 degrees for this recipe—and getting the cookie pan ready. Line a 9×13 inch cake pan with parchment paper and then let’s talk ingredients. 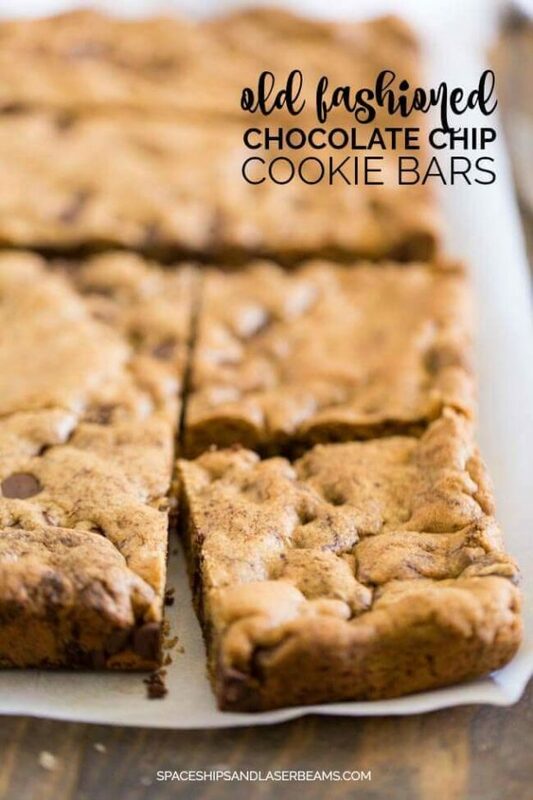 Here’s what you need for these chocolate chip bar cookies. 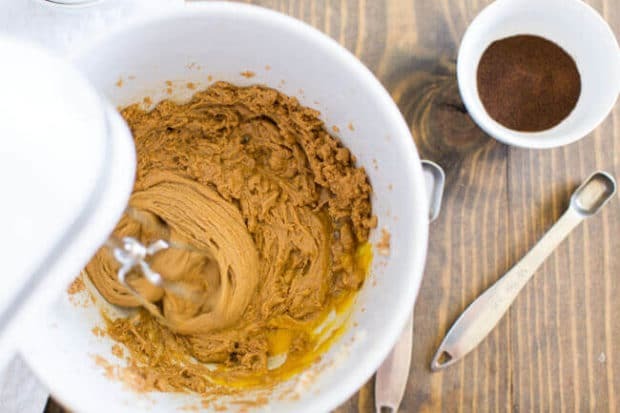 Butter, brown sugar, white sugar, egg, vanilla, flour, baking soda, baking powder, salt, espresso powder and semi-sweet chocolate chips. You start out by creaming the butter and sugars together and then add an egg and a couple of teaspoons of vanilla and mix well. Add flour, salt, baking powder and soda and mix well. The espresso powder and chocolate chips come next. Press the dough into the cookie pan and bake for about 18-20 minutes. Let them cool slightly before you slip them from the pan and cut them into squares. Watch out for little guys who can’t wait to sample warm cookies. They know mom-magic when they smell it. 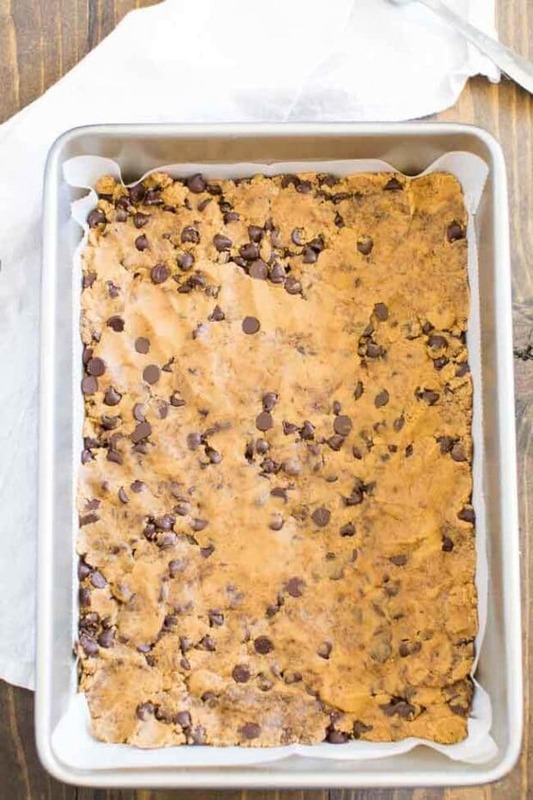 I’m sure your crew will love these chocolate chip cookie bars as much as we do! 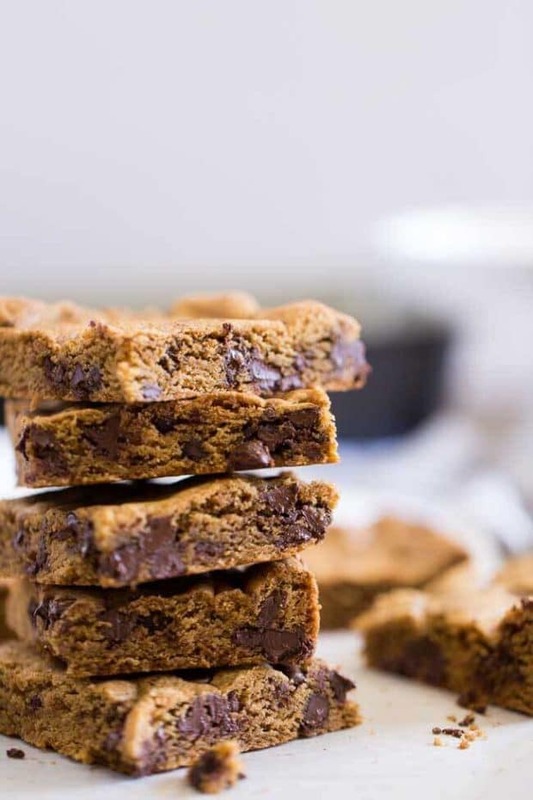 THESE HOMEMADE, OLD-FASHIONED CHOCOLATE CHIP COOKIE BARS TASTE SO GOOD! In a bowl, cream together butter and sugars. 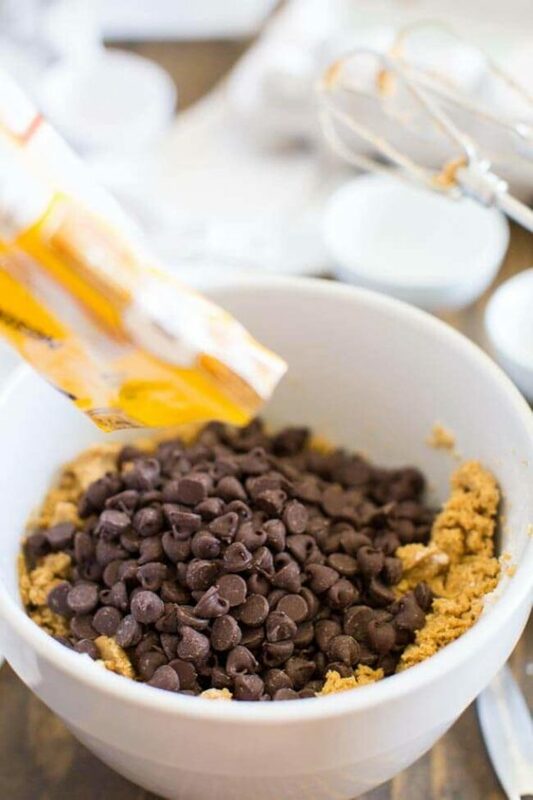 Add flour, salt, baking powder and baking soda to the mixture; mix until dough comes together. Stir in espresso powder and chocolate chips. Line a 9×13 cake pan with parchment paper and press dough into bottom of the pan. Remove from oven and let cool slightly before removing from the pan and cutting. Me and my friends really loved this dessert! Perfect taste!